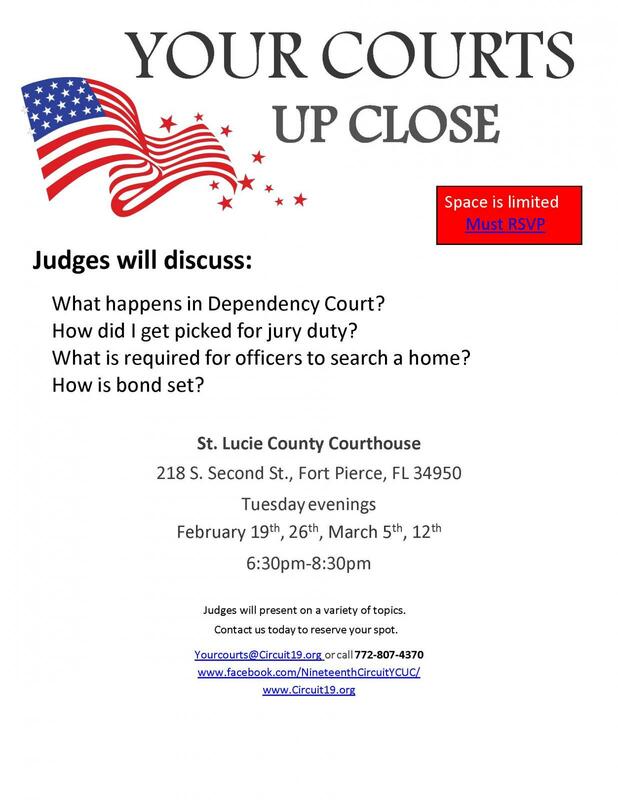 The Nineteenth Judicial Circuit Court and your local county and circuit judges will be hosting a free community outreach training titled "Your Courts Up Close". These training sessions are back by popular demand with new information from different aspects of the judicial system. "Your Courts Up Close" is a once-weekly, four-night program being held each Tuesday evening from 6:30 p.m. to 8:30 p.m. Sessions begin February 19th 2019 and run through March 12th 2019 at the St. Lucie County Courthouse, 218 South Second Street, Ft. Pierce, FL 34950. Reservations are required. To make a reservation, click the link below and fill out the form.